Red Line and Orange Line service is temporarily bypassing Downtown Crossing Station in both directions due to a pipe burst. Park Street was closed for a while earlier. A train had a mechanical issue causing smoke. By bypassing you just mean not making the station stop right? Not that there is a way around the station that I don't know of? 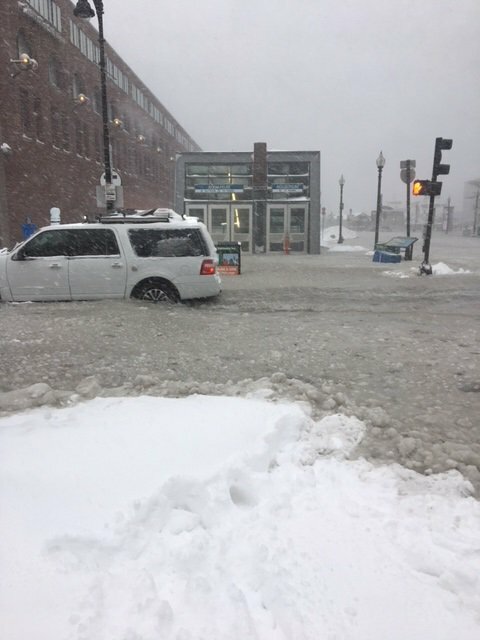 Blue Line service suspended is suspended between Wonderland & Orient Heights due to heavy flooding at Beachmont. No alternative service will be provided. Orange Line experiencing moderate delays due to Boston Fire Department activity at State Street. Green Line E branch service suspended between Copley and Northeastern University due to a switch problem at Copley. Please use the Route 39 bus as alternate service. Red Line Braintree Branch experiencing severe delays due to a disabled train at North Quincy. A single-track shuttle train is running between JFK/UMass and Braintree servicing all stops. Please board on the northbound track for service in both directions until further notice. I got the first alert for this disabled train at about 8:00. By 8:40 delays were severe. Nearly 3 hours later and it still isn't resolved. You should timestamp the update so we know when service resumed. Green Line D branch service suspended between Reservoir and Riverside because of a disabled train at Newton Centre. They've got something a lot more serious than a "disabled train" if they're suspending service.